Most drivers, casual riders and professionals alike, do not realize the importance and benefits of specialized winter tires. Tires are a crucial part of any journey and they do make a huge difference, providing reasonable traction during the winters. Well, winter tires are not recommended year round, but only in regions with lots of snow. The type of wires you choose and the brand makes a huge difference for your safety and comes in handy on the long run. This is the reason tire makers make different types of tires for different seasons and climate. A significant number of crashes and road mishaps occur in adverse weather due to rain, snow, fog, etc. 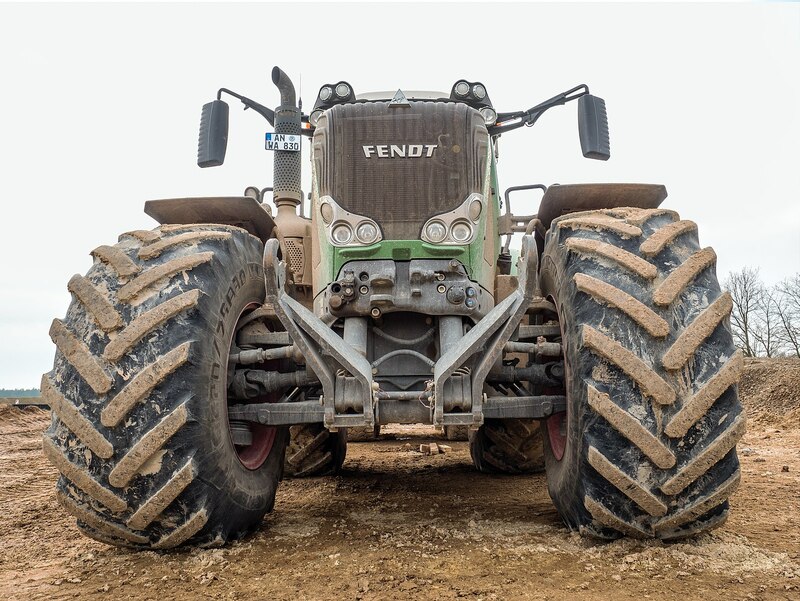 So better handling is required in cold and wet winter conditions for increased traction during extreme conditions. The best mitigation strategy is to pay more attention towards the use of specialized winter tires to reduce weather-related mishaps and improve driver safety in a wide range of winter road conditions. Winter tires come in handy when the temperature drops below 7 degrees celsius. First, winter tires are specially designed to maintain traction in extreme cold, snow, or icy roads, plus they remain flexible than all-season tires. However, choosing the right type of tires is important and the right brand. Bridgestone Blizzak and Michelin X-Ice are the two most popular and best performing snow/winter tires. Although, they both fall in the same Studless Ice & Snow performance segment and perform really well, each has some unique qualities that make one better than the other. Blizzak Performance Winter/Snow tires are specialized high-performance tires that feature high-performance Multicell tread compounds containing millions of tiny dimples or pores on the surface custom molded into tread designs. These small suction cups in the top half of the tread blocks actually adhere to ice-covered roads. Beneath the Multicell tread there’s an all-season tread compound. The tread pattern is fairly open with large grooves and interlocking blocks to help the tires bite into the discard snow. Additionally, it provides impressive grip and control on snow and ice while maintaining flexibility in extreme low temperatures. 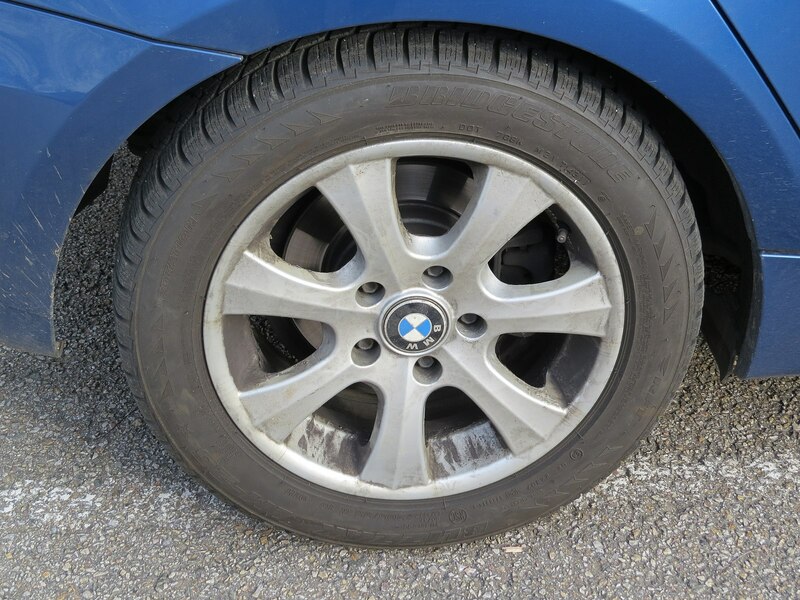 However, dry-road driving can wear of the tires performance in as little as 7,000 miles. They are adequate as long as they are not pushed beyond their limits. X-Ice is the Michelin’s family of Studless Ice & Snow winter tires developed for crossovers, sports utility vehicles, sedans, and coupes for maximum ice and snow traction to handle the challenges of driving in extreme conditions, especially winters. Michelin is the second largest tire manufacturer in the world after Bridgestone. It has pioneered beyond the frontiers of technology over the years after it became the sole supplier of the NASA Space Shuttle program in 2000. It provides quicker acceleration times and increased traction on the snow and ice, thanks to directional full tread depth Cross-Z sipes. The unique shape is so designed to reinforce each tread block which reduces wear while extending the longevity of the tires. 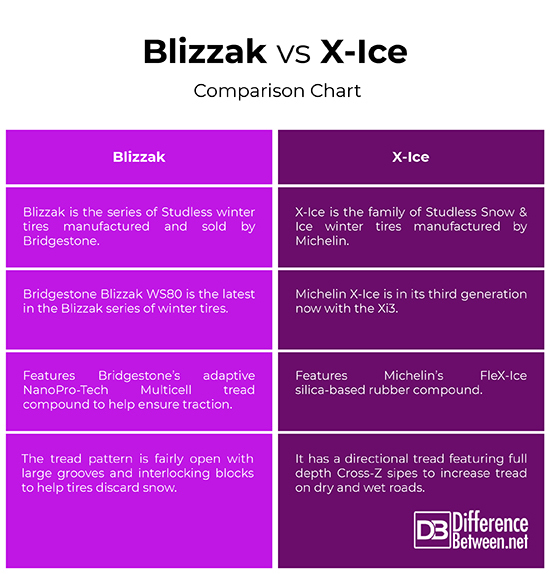 – Both Blizzak and X-Ice are the two most popular and specialized performance winter/snow tires on the market and both fall in the same Studless Ice & Snow performance category. Bridgestone is the name behind the popular Blizzak Studless winter tires, whereas X-Ice is a series of dedicated winter tires manufactured and sold by Michelin. Both offer increased traction in extreme winter conditions and are specially designed to deliver optimal ice and snow performance for a better winter driving experience without worrying about accidental slips and fall accidents. Both are equally better to satisfy your winter driving needs. – The tread pattern looks similar in both Blizzak and X-Ice Studless tires. However, the Blizzak snow and ice tire gains its uncanny traction through its adaptive NanoPro-Tech Multicell tread compound that features millions of tiny dimples or pores on the surface which help ensure traction on the long run. The tread pattern is Blizzak is fairly open with large grooves and interlocking blocks to help the tires bite into and discard snow. The X-Ice has a directional tread featuring full depth Cross-Z sipes and Michelin’s FleX-Ice silica-based rubber compound which offers firmness and optimal traction at higher temperatures for an improved on-road stability in wet conditions. – Blizzak’s aggressive directional tread pattern ensures reliability and exceptional grip in extreme snow/ice conditions. It represents the best in tread compounds when it comes to traction and snow and ice driving experience. The tread blocks are so designed to remain flexible in subfreezing temperatures and the open tread pattern helps the tire bite into and hold snow. It performs exceptionally well on cold pavement. For subduing snow, the X-Ice inspires epic capability and confidence, all the while delivering a greater sense of safety and on-road control in terms of acceleration and braking. Blizzak, however, has a little edge over the X-Ice in terms of comfort and ice traction. Bridgestone Blizzak and Michelin X-Ice are the two most popular and best performing snow/winter tires that fall in the same Studless Ice & Snow tire category for a lasting winter performance. Both perform really well at subfreezing temperatures for wet and dry road stability, however, Michelin provides better on-road stability and handling when it comes to driving on dry roads, whereas Bridgestone is better at maintaining balance and control through steep turns. Bridgestone is the preferred choice of tires when you constantly drive on snowy and icy roads, while Michelin is more like an all-season tire. Sagar Khillar. "Difference Between Blizzak and X-Ice." DifferenceBetween.net. November 12, 2018 < http://www.differencebetween.net/object/difference-between-blizzak-and-x-ice/ >.